Last year, I wrote an exhaustive post on Champagnes and Sparkling wines that I can’t hope to beat. If you’d like a peek, go here. Surprisingly, there were sparkling wines that I didn’t mention in that review but that were mentioned in the comments. Today I bring two of those to your attention (plus a couple more, lol!). Gruet Blanc de Noirs Methode Champenoise American Sparkling Wine Albuquerque, New Mexico Alcohol 12% by Volume – on sale for $14.99 at BevMo! A delightful, non-vintage sparkling wine (or maybe that was just Christmas Eve? lol…), the Gruet should certainly be on your go-to list. It is on par with the Domaine Chandon Blanc de Noirs, though I have to admit I prefer the Domaine’s pretty pink color. The Gruet didn’t have a pink tinge to it (which is expected when you see Blanc de Noirs on the label). Bottled from the Pinot Noir grape, most blanc de noirs sparkling wines have that pretty color – this one did not, even though their website cites a “a fine salmon color”. The only drawback I can see to this wine is that my local grocery store doesn’t carry it, which means you may have to hunt for it. 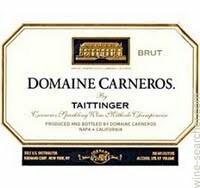 Another new favorite of mine is Domaine Carneros by Taittenger, 2007 & 2008 Brut Methode Champenoise – Napa Valley, California Alcohol 12% by Volume, on sale at Vons for $19.99 . We had the 2007 on Christmas morning, and I will definitely be buying another bottle of it. Lovely neighbors also brought us over a bottle of the 2008 as a Christmas present, so we’ll probably be popping it on New Year’s Eve. Another upscale bottle with a good price to it. Definitely impressive! I taste tested these a couple of years ago at BevMo! – they are running $6.99 on a Club Bev membership (which is free), normally double that. The bottles are fun and festive, the wine is lively and the bubbles fairly small. All in all, a good value for the money. I am surprised (and pleased) that there are so many different sparkling wines that I have yet to taste! Which one is your favorite to ring in the New Year with? On a sober-er note, please go visit Natalie Hartford’s blog today, where she shares with us the proper way to be a responsible hostess with Holiday Mocktails. They sound delicious, and I’m eager to try them! Plus MADD has come out with non-alcoholic cocktails that she said were terrific – give it a look see. May you say goodbye to 2012 with no regrets, and look to 2013 with an open and eager mind, heart, and spirit. Thanks so much for being a part of my life this year! This entry was posted in Uncategorized and tagged BevMo!, champagne, Christine Ashworth, Domaine Carneros Taittinger, Domaine Chandon Blanc de Noirs, Gruet Blanc de Noirs, mocktails, Natalie Hartford, Sparkling Wine, Vons, Yellowglen. Bookmark the permalink. Thank you so much for the recommendations. Now, making a decision will be the hard part. They all sound wonderful. Which would you recommend with lobster? Lobster? Well, it’s hard to go wrong with Mumm’s Cuvee Napa, with the dark blue label. It runs about $14.99. If you can go higher, then I do recommend the Domaine Carneros Taittinger – it was a yummy wine that will pair beautifully with food. Enjoy! You keep this up Kathy Lee and Hoda might contact you for recommendations on wines.. lol Anyway have a great new’s year! LOL Donna – you’re a hoot! (But wouldn’t that be fun?) Cheers hon! Yeah it would be fun! Cheers! You’ve given me a few options aside from the old standby I like to call, “a party in the black bottle.” That’s right — Freixenet! Sam – don’t worry, I won’t hold that against you! There are SO MANY different bottles at so many different prices, it’s hard to figure out. But do yourself a favor – branch out and try something new! (I’m taking a bottle of the Mumm’s Cuvee Napa to dinner with friends tonight.) Cheers hon!